آقاخانی, مریم, شعبانی, الهام, میرزائی, نوربخش. (777). واهم‌افزایی خطر زمین‌لرزه در شهر فیروزکوه. مجله ژئوفیزیک ایران, 10(1), 88-102. مریم آقاخانی; الهام شعبانی; نوربخش میرزائی. "واهم‌افزایی خطر زمین‌لرزه در شهر فیروزکوه". 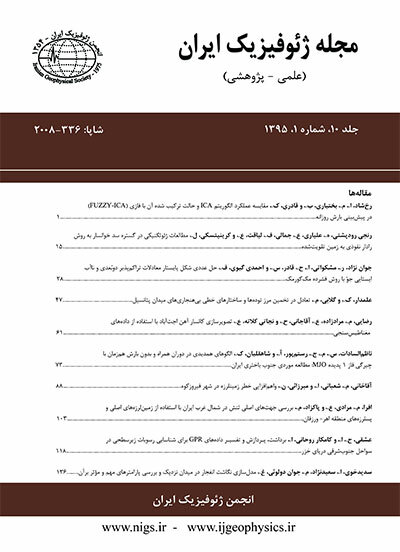 مجله ژئوفیزیک ایران, 10, 1, 777, 88-102. آقاخانی, مریم, شعبانی, الهام, میرزائی, نوربخش. (777). 'واهم‌افزایی خطر زمین‌لرزه در شهر فیروزکوه', مجله ژئوفیزیک ایران, 10(1), pp. 88-102. آقاخانی, مریم, شعبانی, الهام, میرزائی, نوربخش. واهم‌افزایی خطر زمین‌لرزه در شهر فیروزکوه. مجله ژئوفیزیک ایران, 777; 10(1): 88-102. به‌منظور ارزیابی سطوح جنبش نیرومند روی سنگ بستر برای بیشینه شتاب و مقادیر طیفی در شهر فیروزکوه، برآورد خطر زمینلرزه به روش احتمالاتی اصلاح‌شده انجام شده است. برای این منظور، در محدوده °34تا °37عرض شمالی و °52تا °55 طول شرقی، کلیه چشمه‌های بالقوه زمین‌لرزه‌ای موثر تعیین شده و با استفاده از توابع توزیع مکانی، پارامترهای لرزه‌خیزی در هر چشمه به‌دست آمده است. ناحیه مورد مطالعه به شبکه‌ای از نقاط با فواصل °1/0 تقسیم‌بندی شده و نقشه‌های خطر زمینلرزه برای اوج شتاب جنبش زمین (PGA) و شتاب طیفی (Sa) در دوره‌های تناوب 2/0 و 2 ثانیه روی سنگ بستر با 5% میرایی برای 10% و 63% احتمال فزونی در 50 سال تهیه شده است. فرآیند واهم‌افزایی برای تعیین سهم مشارکت زلزله ناشی از گسل‌های مختلف در بازه‌های متفاوت بزرگی و فاصله انجام شده است. نتایج نشان می‌دهد که زمینلرزه‌های بزرگتر و دورتر از ساختگاه کنترل‌کننده سطوح خطر در دوره‌های تناوب بالا هستند و زمینلرزه‌های کوچکتر و نزدیکتر سطوح خطر در شتاب‌های طیفی کوتاه دوره و PGA را کنترل می‌کنند. In this study, a modified “probabilistic seismic hazard assessment” (PSHA) method is used to estimate the level of the potential seismic ground motion in Firoozkouh. A problem that may be encountered in probabilistic studies of seismic hazard for a specific site, for engineering purposes, is the selection of design earthquakes corresponding to a given hazard value. In order to derive a seismic scenario consistent with the results of PSHA for a site and determine the relative contribution of events to the overall seismic hazard, the concept of disaggregation was introduced. The disaggregation of seismic hazard is an effective way to identify the scenario events that contribute to a selected seismic-hazard level. In other words, the disaggregation process separates the contributions to the mean annual rate of exceedance (MRE) of a specific ground-motion value at a site due to scenarios of given magnitude M, distance R, and the ground motion error term, ε. Disaggregation results could change with the spectral ordinate and return period, thus more than one single event may dominate the hazard especially if multiple sources affect the hazard at the site. These results can provide useful information for better defining the design scenario and selecting corresponding time histories for seismic design. In most cases, as the probability decreases, the hazard sources closer to the site dominate. Larger, more distant earthquakes contribute more significantly to hazard for longer periods than shorter periods. In this study, the seismic hazard disaggregation process is performed to identify dominant scenarios in “peak ground acceleration” (PGA) and 5% damped 0.2 and 2.0 s spectral accelerations corresponding to mean return periods (MRPs) of 50 yr, and 475 yr (hazard levels of 63% and 10% probability of exceedance in 50 yr, respectively) in Firoozkouh city. In this regard, potential seismic sources and their seismicity parameters have been estimated based on the concept of spatial distribution function in 34º–37ºN latitudes and 52º–55º E longitudes in grid intervals of 0.1º. For each point using proper attenuation relationships, PGA, 0.2 and 2.0 s spectral acceleration values with 63% and 10% probabilities of exceedance in 50 yr have been calculated using the EZ-FRISK (version 7.43) code. The hazard can be simultaneously disaggregated in different types of bin. The result of seismic hazard disaggregation are presented in terms of 1-D M, R and ε bins and 2-D M-R bins. Bins of width 0.4 in magnitude, 10 km in distance, and 0.2 in ε are selected. The disaggregation results in terms of probability density function (PDF) are reported, which is obtained by dividing the probability mass function (PMF) contribution of each bin by the bin’s size, thus the PDF representation is independent of the bin’s amplitude. The results identify the distribution of the earthquake scenarios that contribute to exceedance of PGA and 5% damped 0.2 and 2.0 s spectral accelerations for 50 yr and 475 yr MRPs, in terms of magnitude and distance (M-R). Dominant scenarios are identified for interest hazard levels in Firoozkouh city. میرزائی، ن.، قیطانچی، م.، ناصریه، س.، رئیسی، م.، ظریفی، ز. و طبائی، ق.، ،1381پارامترهای مبنایی زمینلرزه‌های ایران: انتشارات دانش‌نگار. Abdi, F., Mirzaei, N., and Shabani, E., 2013, Ground-motion scenarios consistent with PSH deaggregation for Tehran, capital city of Iran: Nat. Hazards, Earth Syst. Sci., 13, 679–688. Barani, S., Spallarossa, D., and Bazzurro, P., 2009, Disaggregation of probabilistic ground-motion hazard in Italy, Bull. Seismol. Soc. Am., 99, 2638–2661. Bazzurro, P., and Cornell, C. A., 1999, Disaggregation of seismic hazard, B. Seismol. Soc. Am., 89, 501–520, 1999. Benreuter, D. L., 1992, Determining the controlling earthquake from probabilistic hazards for the proposed Appendix B: Lawrence Livermore National Laboratory Report UCRL-JC-111964, Livermore, California. Benreuter, D. L., Boissonnade, A. C., and Short, C. A., 1996, Investigation of techniques for the development of seismic design basis using probabilistic seismic hazard analysis: Lawrence Livermore National Laboratory, Rept. NUREG/CR-6606, prepared for U.S. Nuclear Regulatory Commission. Boissonnade, A., Chokshi, N., Benreuter, D., and Murphy, A., 1995, Determination of controlling earthquake from probabilistic seismic hazard analysis for nuclear reactor site: Proc. of the Thirteenth International Conference on Structural Mechanics in reactor technology, SMiRT 13, Universidade Federal do Rio Grande do Sul, Porto Alegre, Brazil, August 13–18, 771–776. Boore, D. M., and Atkinson, G. M., 2008, Ground-motion prediction equations for the average horizontal component of PGA, PGV and 5%-damped PSA at spectral periods between 0.01s and 10.0s: Earthquake Spectra, 24(1), 99–138. Campbell, K. W., and Bozorgnia, Y., 2008, Empirical ground motion model for shallow crustal earthquakes in active tectonic environments developed for the NGA project: Proceedings of Fourteenth World Conference on Earthquake Engineering, Paper No. 03-02-0004. Chapman, M. C., 1995, A probabilistic approach for ground-motion selection for engineering design: Bull. Seismol. Soc. Am., 85, 937–942. Chiou, B. S. J., and Youngs, R. R., 2008, An NGA model for the average horizontal component of peak ground motion and response spectra: Earthquake Spectra, 24(1), 173–215. Cramer, C. H., and Petersen, M. D., 1996, Predominant seismic source distance and magnitude maps for Los Angeles, Orange, and Ventura Counties, California: Bull. Seismol. Soc. Am., 86, 1645–1649. EZ-FRISK 7.43- Software for Earthquake Ground Motion Estimation. http://www.ezfrisk.com/ Last visited on 23 August 2010. Harmsen, S., Perkins, D., and Frankel, A., 1999, Deaggregation of probabilistic ground motions in the central and eastern United States: Bull. Seismol. Soc. Am., 89, 1–13. Kijko, A., and Graham, G., 1998, "Parametric-Historic" procedure for probabilistic seismic hazard analysis. Part I: Assessment of maximum regional magnitude mmax: Pure Appl. Geophys., 152, 413–442. Kijko, A., and, Sellevoll, M. A., 1992, Estimation of earthquake hazard parameters from incomplete data files, Part II: Incorporation of magnitude heterogeneity, Bull. Seismol. Soc. Am., 82, 120–134. Kimball, J. K., and Chander, H., 1996, Department of Energy seismic siting and design decisions: Consistent use of seismic hazard analysis: Proc. Twenty-Fourth Water Reactor Safety Information Meeting 3, 141–160, Bethesda, October 21–23, U.S. Nuclear Regulatory Commission, NUREG/CP-0157. McGuire, R. K., 1995, Probabilistic seismic hazard analysis and design earthquakes: closing the loop: Bull. Seismol. Soc. Am., 85, 1275–1284. Mirzaei, N., Gao, M., and Chen, Y. T., 1997, Seismicity in major seismotectonic provinces of Iran: Earthquake Research in China, 11, 351–361. Mirzaei, N., Gao, M., and Chen, Y. T., 1998, Seismic source regionalization for seismic zoning of Iran: Major seismotectonic provinces: J. Earthquake Prediction Research, 7, 465–495. Mirzaei, N., Gao, M., and Chen, Y. T., 1999, Delineation of potential seismic sources for seismic zoning of Iran: J. Seismology, 3, 17– 30. Peláez Montilla, J. A., Casado, C. L., and Romero, J. H., 2002, Deaggregation in magnitude, distance, and azimuth in the south and west of the Iberian Peninsula: Bull. Seismol. Soc. Am., 92, 2177–2185. Priestley, K., Baker, C., and Jackson, J., 1994, Implications of earthquake focal mechanism data for the active tectonics of the south Caspian Basin and surrounding regions: Geophys. J. Int., 118, 111–141. Shabani, E., and Mirzaei, N., 2007, Probabilistic seismic hazard assessment of the Kermanshah-Sanandaj region of western Iran: Earthq. Spectra, 23, 175–197. Shi, Z., and Zhang, Y., 1996, Seismic intensity zoning map of China: in Achievements of Hazard Prevention and Reduction in China, Seismological Press, Beijing, 153–164. Shi, Z., and Gao, M., 1993, Seismic zoning map of China (review): in Continental Earthquake, IASPEI publication series for the IDNDR, 3, 62–68. Shi, Z., Yan, J. and Gao, M., 1992, Research on the principles and methodology of seismic zonation: Results of the trials in North China: Acta Seismol. Sinica, 5, 305–314. Tahernia, N., Khodabin, M., and Mirzaei, N., 2011, Mixed model for interoccurrence times of earthquakes based on the expectationmaximization algorithm: Acta Geophysica, 59, 872–890. Ye, H., Zhou, Y., Zhou, Q., Yang, W., Chen, G. and Hao, C., 1993, Study on potential seismic sources for seismic zonation and engineering seismic hazard analysis in continental areas: in Continental Earthquakes, IASPEI publication series for the IDNDR 3, 473–478. Yucemen, M. S., and, Gulkan, P., 1994, Seismic hazard analysis with randomly located sources: Natural Hazards, 9, 215– 233.